Wow we've made it half way through the year and hasn't that gone quick. According to Good Reads I've managed to read 88 books so far this year, that's 59% of my target, ahead of schedule!! If you didn't spot it already, there is a giveaway live on my blog to win a copy of Shoutykid. A funny book that I would say it is aimed at children more between the ages of 7-12, my 8 year old daughter really enjoyed it!! Lots of great books linked up last week so I thought I would share one childrens book recommendation and one adults one. Lindsey over on 101 things to do with kids reviewed Jumpy Jack and Googily. The ending has not been revealed and I don't know about you but I am now eager to find out just what happens!! Melanie over on A Bit of Mel Time recommended the very romantic The French For Always. I am a sucker for a good romance and Mel's 5 star rating made me put this straight on my TBR list. Now on to the link up. 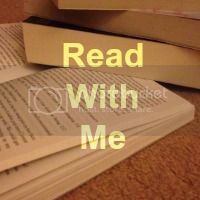 If you happen to be new, please take a look right here to find out a little bit more about #ReadWithMe. For all you golden oldies, get linking up all those lovely book posts, new or old, review, giveaway or a simple recommendation, I want to read them all. As always please take the time to comment on a couple of the other posts, I know all comments are really appreciated. And I would love you forever if you would be so kind as to display my badge. I had two book reviews this week; hope that's ok! Am looking forward to having a look at the others for additions to my reading list! Thanks for hosting! Another reading link I can join in on :D this is exciting!